Odkryj nowy, osobisty sposób kupowania i sprzedawania ubrań naVinted. Znajdź prawdziwe perełki od swoich ulubionych marek.Dodawaj ogłoszenia i znajdź nowych właścicieli dla ubrań, którychjuż nie nosisz. Dołącz do społeczności, która liczy już 12 milionówstylowych kobiet. Zaoszczędź na wymarzonych ubraniach i zwiększswój budżet sprzedając na Vinted. Sprzedawaj ubrania Ustal cenę ikontroluj zniżki. Wystawiaj za darmo Sprzedawanie na Vinted jestbezpłatne. Zbuduj stylową sieć kontaktów Znajdź osoby, którepokochają Twój styl i zdobądź kupujących. Kupuj przedmioty znanychmarek i znajdź perełki, które nie są już dostępne w sklepach.Znajdź sprzedających w pobliżu Użyj filtrów lokalizacji, abyznaleźć najlepsze oferty w pobliżu i zaoszczędzić na przesyłce.Przeglądaj oferty z wideo Zobacz więcej szczegółów oglądającprzedmiot na filmiku. Rozmawiaj ze sprzedającymi Poznaj każdy detalprzedmiotu, który chcesz kupić. Vinted to nie jest zwykła aplikacjamodowa. Tutaj odkryjesz stylowe porady, poznasz inne użytkowniczkii porozmawiasz na każdy temat. Jesteś już tylko krok od byciaczęścią Vinted. Ściągnij aplikację za darmo - odkryj nowy sposóbrobienia zakupów i poznaj dziewczyny, które kupią od Ciebieubrania! Masz problem z korzystaniem z aplikacji lub pomysł jak jąulepszyć? Napisz do nas na [email protected] i pomóż nam działaćlepiej! Discover a new personal shopping and selling experience on Vinted.Find vintage gems from your favorite brands. List and give theclothes you used to love a new owner. Join 11 million stylish womenin our community. If you love fresh style ideas, get Vinted! Savefor your next big dream and boost your budget selling on Vinted.Cool Nike sneakers, classy Brandy Melville handbags or Ralph Laurendesigner clothes - great brands are flying off our shelves. Selltop brands for what they’re worth: Set your price, and control yourdiscounts. List for free, always: Until you make a sale, Vintedwon’t cost you a cent. Build your style network: Find people wholove your style and get loyal buyers. Shop every well-known brandand find gems that aren’t in stores anymore. New and gently usedboho clothes from Free People, chic Zara dresses and cozy UGG boots- you’ll find deals on these and so much more with Vinted. Findnearby sellers: Use location filters to spot the best deals in yourarea and save on shipping. Browse video listings: See more details,see the item in action and get a 360 view. Pay through our securesystem: Receive buyer protection with every purchase. Vinted isn’tjust another fashion app. It’s where you can explore style ideas,meet women from all backgrounds and discuss anything in ourcommunity. You’re only a step away from making Vinted work for you.Download Vinted for free - experience shopping that feels extrapersonal, and meet fashionistas you’ll sell your clothes to. Haveissues using the app or ideas on how to make it better? Let us knowat [email protected] - we’d love to hear your thoughts! Discover a better shopping and selling experience on the world’sbiggest fashion marketplace. Find exceptional deals on top brandsin just a few taps. Sell clothes to 12 million Vinted members. MAKEMONEY SELLING Every 49 seconds, one of our members completes asale. List and see how fast you’ll sell. • Make sales simple. Savetime and use our in-app payments. • Get seller protection. Havepeace of mind knowing our support team is always there to help. •Sell great brands for what they’re worth. Set your price, andcontrol your discounts. 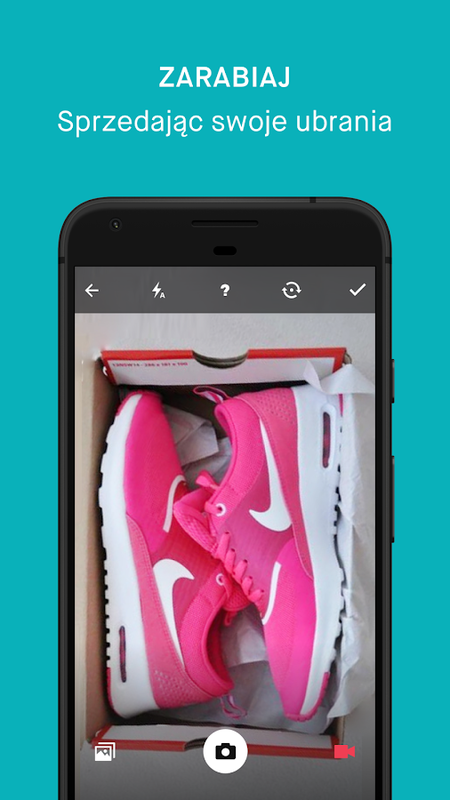 Cool Nike sneakers, classy Brandy Melvillehandbags and TOMS shoes - great brands are flying off our shelves.ENJOY SHOPPING Shop for top brands, find gems that aren’t in storesanymore and pay for purchases securely right on the app. New andsecondhand boho clothing from Free People, chic Zara dresses andcozy UGG boots - find deals on these and so much more with Vinted.• Find what you need fast. Filter through our catalogue to find theright brands, sizes and prices. • Browse video listings. Get moredetails, see the item in action and enjoy a 360 view. • Keep yourpersonal info safe. Pay through the app without sharing yourpersonal details with the seller. GET VINTED Vinted isn’t justanother fashion app. It’s where you can explore style ideas, meetwomen from all backgrounds and discuss anything on our forum.You’re only a step away from making Vinted work for you. DownloadVinted for free - experience shopping that feels extra personal,and meet the fashionistas you’ll sell your clothes to. Atrask naują būdą pirkti ir parduoti drabužius Vinted platformoje.Rask vintažinius savo mėgiamų prekių ženklų perliukus. Įkelk savonebedėvimus drabužius ir rask jiems naujus šeimininkus. Prisijunkprie 12 milijonų stilingų merginų bendruomenės. Sutaupyk savoišsvajotam pirkiniui ir padidink savo biudžetą su Vinted pagalba.Parduok spintos lobius Nustatyk kainą ir kontroliuok nuolaidas.Įkelk drabužius nemokamai Pardavinėjimas Vinted platformoje yranemokamas. Susikurk savo žmonių tinklą Atrask žmones, kuriemspatinka Tavo stilius, - jie gali tapti Tavo ištikimais pirkėjais.Pirk populiarių prekių ženklų perliukus ir drabužius, kuriųnebeįmanoma rasti parduotuvėse. Rask netoliese esančias pardavėjasNaudok vietovės filtrus, kurie padės atrasti geriausius, netolieseesančius pasiūlymus, - taip išvengsi mokesčių už siuntimą.Peržiūrėk video skelbimus Pamatyk detalesnį vaizdą, žiūrėdama prieskelbimų pridėtus video filmukus. Susirašinėk su pardavėjomisSužinok kiekvieną Tave dominančią detalę, kad jaustumeisiužtikrinta dėl savo pirkinio. Vinted nėra eilinė su mada susijusiprogramėlė. Čia turi galimybę atrasti stiliaus idėjas, susipažintisu skirtingomis merginomis ir diskutuoti apie bet ką su mūsųbendruomenės narėmis. Liko tik žingsnis iki tapimo Vintedbendruomenės dalimi. Atsisiųsk Vinted nemokamai - išbandyk naująbūdą apsipirkti ir susipažink su merginomis, kurios pirks Tavospintos perliukus! Pastebėjai nesklandumų? Turi idėjų, kaipgalėtume patobulinti programėlę? Parašyk mums - [email protected] pastabos padeda mums tobulėti! Discover a new way to buy andsell clothes Vinted platform. Find your favorite vintage trademarkrecords. Upload your nebedėvimus clothes and find them new owners.Join the 12 million girls in stylish community. Save yourišsvajotam purchase and increase your budget with the help ofVinted. Sell cabinets treasures Set the price and controldiscounts. Upload your clothes for free Selling Vinted platform isfree. Create your own network of people Discover the people wholike your style - they can become your loyal customers. Buy popularbrands pearls and clothes, which can no longer be found in stores.Find nearby vendor Use the filters area, which will help to findthe best, nearby the proposals - thereby avoiding fees for sending.View video ads See the detailed image, looking at the ads attachedvideo clips. Correspond Sellers You know you are interested inevery detail that you would feel confident about your purchase.Vinted no ordinary fashion related applet. Here you have theopportunity to find style ideas to get acquainted with differentgirls and discuss anything with our community members. Remainedstep to becoming part of the community Vinted. Download Vinted free- try a new way to shop and find the girl who bought your cabinetspearls! If you notice problems? I have an idea how we can improvethe app? Write to us - [email protected] Your comments help usimprove! Objev nový, osobitější způsob nakupování a prodeje oblečení naVinted, kde najdeš záplavu vintage kousků svých oblíbených značek.Připoj se k dalším 12 milionům uživatelek naší stylové komunity.Jestli stejně jako my miluješ neotřelý a svěží přístup knakupování, stáhni si Vinted hned teď! Splň si své další módní snya vylepši svůj příjem prodejem na Vinted. Prodávej za cenu jakouchceš Nastav cenu a případné slevy na své kousky. Nahrávej předmětyzdarma Prodej na Vinted tě nebude stát ani korunu. Získej novékontakty Uživatelky, které si zamilují tvůj styl a stanou sevěrnými fanynkami tvého katalogu. Nakupuj známé značky a objevujskvosty, které už v obchodě neseženeš. Vyhledej prodejce ve svémokolí Použij filtr lokace k vyhledání nejlepších nabídek ve tvémokolí a ušetři na poštovném. Sleduj videa na Vinted Prohlédni sivšechny detaily předmětu z 360 stupňů. Pokecej s prodejcem Můžes sedoptat na cokoliv ohledně předmětu a ujistit se tak o svém nákupu.Vinted není jen další z mnoha módních aplikací - je místem, kdemůžeš sdílet svůj styl, setkávat se s dívkami a ženami všech názorůa diskutovat v naší ojedinělé komunitě. Už jen krůček tě dělí odVinted: Stahuj aplikaci zdarma a užij si maximální volnost a zábavuz nakupování. Máš problémy s používáním naší aplikace nebo nápad najejí vylepšení? Dej nám vědět na [email protected] a pomoc nám sezlepšovat! Meet over 200,000 girls who are ready to shop your closet. Listclothes FREE and boost your income selling old favourites. Raidthousands of closets right from your phone to finally find thestylish pieces you’ll love for a price YOU WANT to pay. NEW: UsePayPal on Vinted at no extra cost! Download the free Vinted app anddive headfirst into an upbeat community of friendly and style-savvygirls - Vinties. EARN CASH - Snap a few pics, describe your itemand BAM! Just one minute and you’re ready to sell. - Freedom!Decide how much you make: price the way YOU want. - Postage - sosimple. Enter your barcode from the Post Office so we can trackyour parcel. - Transfer your earnings to your bank account rightafter the buyer receives her goodies. SAVE ON TRENDS - Build yourown feed by choosing your own sizes and by following brands andother Vinties. Hello there, perfect fit! - Check out the entirelysearchable catalogue to find deals on clothes that are right foryou. - Shopping baskets? Pff. Chat with sellers directly and knowevery detail. - Your money’s safe and YOU DECIDE: tell us you’rehappy with what you got or get a refund. GET INSPIRED! Join thecommunity that’s on a mission to make second-hand the first choice.Be yourself and connect with other girls in the forums or throughdirect messages. DIY, style tips, relationship advice? Yes! There’sa fellow Vinty for everything. Smart wardrobe reinventions, stylecrushes and new friends all happen here on Vinted. Share the joywith so many other girls who are crazy about Vinted on Twitter!Don’t miss out and download now - it’s FREE and we’d love to meetyou. • We're always working hard to make our members happy! If youhave any issues, contact us at https://www.vinted.co.uk/help. •Having issues using the app, or ideas how to make it even better?Let us know at [email protected] - we’d love to hear yourthoughts! Chodzisz na siłownię, ale masz problemy z poprawnym wykonywaniemniektórych ćwiczeń? Chciałbyś dowiedzieć się, jak powinna wyglądaćpoprawna rozgrzewka lub w jaki sposób zrobić „martwy ciąg” czy„wyciskanie żołnierskie”? Szukasz nowych, alternatywnych sposobówna rozbudowę swoich mięśni?Jeśli choć na jedno z powyższych pytań,Twoja odpowiedź brzmi „TAK” – Atlas ćwiczeń KFD.PL to aplikacjaidealna dla Ciebie!W czym konkretnie aplikacja pomaga i jakie mafunkcjonalności?- dowiesz się, jak poprawnie wykonywaćnajpopularniejsze ćwiczenia,- będziesz mógł skorzystać z gotowychplanów treningowych przygotowanych przez profesjonalnego trenerapersonalnego i zawodnika kulturystyki,- dowiesz się, jakie mięśniepracują przy wybranym ćwiczeniu,- dowiesz się, jakie są najczęściejpopełniane błędy,- przeczytasz wskazówki od profesjonalistów,-obejrzysz profesjonalne zdjęcia i filmy instruktażowe,- poznaszsuplementy diety, które pomogą Ci w osiągnięciu wymarzonejsylwetki,- przeczytasz w niej wiele ciekawy artykułów na tematzasad treningowych, niezbędnych podstawach, treningachinterwałowych, aerobowych- dowiesz się o najnowszych promocjachdostępnych w sklepie KFD.PLMarzysz o wyrzeźbionych mięśniachbrzucha?Świetnie trafiłeś, w naszej aplikacji znajdziesz wielesposobów jak ćwiczyć mięśnie brzucha. Mamy również całe planytreningowe, które pozwolą Tobie osiągnąć wymarzoną sylwetkę!Listaparti mięśniowych dostępnych w aplikacji:- klatka piersiowa- plecy-barki- biceps- triceps- nogi i pośladki- przedramiona- brzuchOpiszachęca? SPRAWDŹ, to nic nie kosztuje :)W aplikacji brak jestjakichkolwiek reklam.Wszystkie funkcjonalności dostępne sąbezpłatnie.You go to the gym, but you have problems with the properperformance of certain exercises? Would you like to learn how tocorrect warm-up should look like or how to do the "deadlift" or"squeezing soldier"? You are looking for new, alternative ways toexpand their muscles?If even one of the above questions, youranswer is "YES" - Atlas KFD.PL exercise is an application perfectfor you!In the specific application helps, and what features it?-you will learn how to correctly perform the most popular exercise,-you can use ready-made training plans prepared by a professionalpersonal trainer and bodybuilding competitor,- you will learn howmuscles work at the selected exercise,- you will learn what are themost common mistakes,- read tips from professionals- look at thephotos and professional instructional videos,- know dietarysupplements that will help you achieve your dream figure,- read itmany interesting articles on the principles of training, thenecessary bases, interval training, aerobic- you will learn aboutthe latest promotions available in the store KFD.PL Do you dream ofsculpted abdominal muscles? Well you've come in our application youwill find many ways to exercise your abdominal muscles. We alsohave all the training plans that will allow you to achieve yourdream figure! List parti muscle available in the application: -Chest- back- shoulders- biceps- triceps- legs and buttocks-forearms- stomachDescription encouraged? CHECK, it's free :)In theapplication, there are no ads.All functions are available free ofcharge. "Aplikacja „Moja ciąża” przeprowadzi Cię przez niezwykły czasciąży: od pierwszych dni aż do porodu. Tydzień po tygodniu, wewszystkich trzech trymestrach możesz na nią liczyć. Zawierapraktyczne porady ciążowe, filmy, zdjęcia i funkcje pomagające nabieżąco obserwować rozwój Twojego dziecka. Dowiesz się o czymświadczą sygnały wysyłane przez Twój organizm w trakcie ciąży.Przyjemny interfejs sprawi, że korzystanie z aplikacji będzienaprawdę łatwe i przyjemne. Opiekunem merytorycznym aplikacji „Mojaciąża” jest ginekolog-położnik, dr Grzegorz Południewski, którywraz z nami odpowie na wszystkie pytania i pomoże rozwikłać ciążoweproblemy. W aplikacji Moja Ciąża znajdziesz wiele przydatnychfunkcji: KALENDARZ CIĄŻY Obserwuj jak rośnie dziecko w kolejnychtygodniach ciąży. Oglądaj zdjęcia i filmy, z których możeszdowiedzieć się jakie zmiany Cię czekają i czego powinnaś sięspodziewać. Sprawdź aktualny tydzień ciąży i zapisz wyznaczonytermin porodu. KALKULATOR WAGI Możesz kontrolować swoją wagę, którama ścisły związek z prawidłowym rozwojem płodu. Kalkulator pozwoliCi też przewidzieć jak się będzie zmieniała Twoja waga wnadchodzących tygodniach ciąży. ORGANIZER Pomoże Ci w zapamiętaniuwszystkich ważnych spraw, m.in. wizyt lekarskich, badań iplanowanych zakupów. Podpowie też jak skompletować torbę do porodui wyprawkę dla dziecka. W kategorii PLAN DNIA znajdziesz SKLEP zproponowanymi przez nas artykułami ciążowymi. IMIENNIK Znajdziesz wnim listę imion, która pozwoli wybrać to jedno, właściwe. Możeszrównież przeglądać rankingi, dodawać imiona do ulubionych isprawdzać daty imienin. OFFLINE Moja Ciąża działa również w trybieoffline. Nadal poinformujemy Cię o ważnych sprawach związanych zciążą. Prezentowane w aplikacji Moja Ciąża treści, w tym treścipochodzące od specjalistów z zakresu medycyny mają charakteredukacyjny i nie zastąpią bezpośredniego kontaktu z lekarzem.Niezależnie od zapoznania się z tymi treściami, sugerujemybezpośrednią konsultację z lekarzem." "Application" My pregnancy"takes you through the unusual time of pregnancy: from the earlydays up to the birth. Week after week, all three trimesters you cancount on it. It contains practical advice on pregnancy, videos,photos and features to help keep an eye on your child's development. You will learn as evidenced by signals sent by your body duringpregnancy. a pleasant interface make use of the application will bereally easy and fun. Guardian substantive application "Mypregnancy" is a gynecologist-obstetrician, Dr. GregoryPołudniewski, who together with us to answer all questions and helpsolve the problems of pregnancy. In My Pregnancy app you will findmany useful features: PREGNANCY CALENDAR Watch as your child growsin the coming weeks of pregnancy. See photos and videos, which youcan find out what changes await you and what you should expect.Check the current week of pregnancy and childbirth save thedeadline. WEIGHT CALCULATOR You can control your weight, which hasa close relationship with the normal development of the fetus. Thecalculator will allow you to predict how it will change your weightin the coming weeks pregnant. ORGANIZER It will help you toremember all the important issues, including medical visits, testsand planned purchases. Also will tell how to assemble a bag ofbirth and layette for the baby. In the category SCHEDULE SHOP youwill find the articles proposed by us ciążowymi. NAMESAKE Insideyou'll find a list of names, which will choose the one competent.You can also view rankings, add names to favorites and name-checkedthe date. ONLINE My Pregnancy also works offline. We continue toinform you about important matters related to pregnancy. Presentedin the My Pregnancy app content, including content originating fromspecialists in the field of medicine they are educational in natureand can not replace direct contact with the doctor. Regardless ofacquainted with the content, we suggest that direct consultationwith a doctor. " == WSZYSTKO O LEKACH W JEDNEJ APLIKACJI == MOBILNA APTECZKA: ->przypomnienia o zażyciu leku [NOWOŚĆ!] -> zarządzanieprzyjmowanymi lekami -> weryfikacja możliwych interakcji leków zFarmaceutą -> monitorowanie terminu ważności leku MOBILNYDOZ.PL: -> dostęp do pełnej oferty doz.pl - leki (także nareceptę) - suplementy - dermokosmetyki - zioła - sprzęt medyczny-> możliwość zamawiania leków z komórki -> darmowa dostawazamówień do apteki -> śledzenie statusu zamówienia ->szczegółowe informacje o lekach -> powiadomienia o ponownejdostępności / wyprzedażach -> lokalizacje najbliższych aptekJeśli miałeś kiedyś problem ze znalezieniem swojego leku w aptecelub szukasz korzystnych cen, sprawdź, co oferuje DOZ.pl -przetestuj naszą aplikację mobilną! == ALL IN ONE medicines ==APPLICATION MOBILE KIT: -> reminders about taking medication[NEW!] -> management of concomitant medicinal products ->verification of possible interactions with Pharmacist ->monitoring the validity of the drug MOBILE DOZ.PL: -> access tothe full range of doz.pl - medications (including prescription) -supplements - dermocosmetics - Herbs - medical equipment ->possibility of ordering drugs from the cell -> free delivery oforders to the pharmacy -> tracking order status -> Detailedinformation about medicines -> notifications about theavailability / sales -> locations nearest pharmacy If you everhad trouble finding your drug in the pharmacy or looking forfavorable prices, check what it offers DOZ.pl - test our mobileapp! Domy.pl – numer 1 w nieruchomościach to aplikacja, dzięki którejłatwo i szybko można przeglądać oferty sprzedaży i wynajmumieszkań, domów, działek oraz inwestycji komercyjnych z całegokraju. Dzięki intuicyjnej wyszukiwarce przeszukującej ponad milionofert, użytkownik otrzymuje ściśle dopasowaną listę ogłoszeń,zgodną z wcześniej wpisanymi kryteriami, jak np. : typnieruchomości, rodzaj transakcji, cena, powierzchnia, liczba pokoi.Sam wybór lokalizacji nieruchomości można określić na dwa sposoby.Pierwszym z nich jest wpisanie początkowych liter miasta lubdzielnicy w której ma nastąpić wyszukiwanie i wówczas aplikacjasama podpowie pełną nazwę, kolejny to wyszukiwanie nieruchomości wwybranym promieniu od miejsca, w jakim obecnie znajduje sięużytkownik . Można również skorzystać z historii wcześniejwybranych lokalizacji, wskazując ponownie jedną z nich. Listawyników wyszukiwania przedstawia kluczowe informacje dotyczącedanej oferty: miniaturę zdjęcia, lokalizację, cenę, powierzchnię.Dodatkowym ułatwieniem dla użytkownika jest wyszarzanie ogłoszeń,których szczegóły były wcześniej obejrzane oraz oznaczenie gwiazdkąofert wskazanych jako ulubione. Ponadto, listę wyników możnafiltrować po cenie, powierzchni i dacie dodania. Aby zapoznać sięze szczegółami danego ogłoszenia wystarczy kliknąć w nie na liściewyników. Wówczas - oprócz galerii zdjęć, opisu nieruchomości, mapyi kontaktem do oferenta można „przejść się” po okolicy -korzystając z przycisku Street View. Z poziomu szczegółówogłoszenia możliwe jest również wysłanie zapytania do oferenta,przesłanie informacji o ogłoszeniu na dowolny adres e-mail(przycisk poleć znajomemu), bądź też wykonanie bezpośredniegopołączenia telefonicznego do oferenta. Aby szybko przejrzeć ofertydodane do ulubionych lub skorzystać z historii wyszukiwaniawystarczy kliknąć w boczne menu. Z tego poziomu można równieżrozpocząć nowe szukanie. Sprawdź jak łatwe i przyjemne może byćwyszukiwanie wymarzonej nieruchomości. Domy.pl - number one in realestate is an application that makes it easy and fast, you canbrowse offers sales and rental of apartments, houses, plots andcommercial projects across the country. With intuitivesearch-scanning more than one million listings, closely matchingthe user receives a list of announcements, consistent with thepreviously entered criteria, such as type of property, type oftransaction, price, size, number of rooms. The choice of thelocation of the property may be determined in two ways. The firstis to enter the initial letters of the town or district in whichthe search is to take place and then the application itself willtell the full name, another is a property search in the selectedradius from the place in which the user's current. You can alsotake advantage of the history of pre-selected locations, againpointing to one of them. List of Search Results shows the keyinformation concerning the offer: thumbnail images, location,price, surface. Another convenience for the user is grayed out ads,details of which were previously viewed and the tenders indicatedwith an asterisk marking it as a favorite. In addition, the list ofresults can be filtered by price, area, and date added. To see thedetails of the ad simply click on it in the list of results. Then -in addition to the gallery, description of the property, maps andcontact the supplier can "move up" in the area - using the StreetView button. With the level of detail announced it is also possibleto send a request to the tenderer send information on the notice toany e-mail (send to friend button), or make a direct phone call tothe supplier. To quickly view the jobs added to your favorites oruse the search history just click on the side menu. From here youcan also start a new search. Find out how easy and fun, you cansearch your dream property.